Humans have had a significant connection to the world around them since the beginning of time. Humans by nature are explorers and experiencing all the various places Earth has to offer makes people feel in tune with it. The oceans are some of the most mysterious parts of Earth, and have not been explored as thoroughly as land. While they make up over two-thirds of our home, we know less about the oceans than we do about the Moon. There are multitudes of plant and animal species that have yet to be discovered, most likely because humans haven’t been able to travel deep enough in the oceans. The fact that we do not know every species in the water is slightly unnerving. Although water is seen as a refresher, the oceans are very dangerous, and can put us in difficult situations if we aren’t careful. Probably the most vulnerable that human can be, is when they are wading in the deep ocean, waiting for some creature to venture to the surface to get a taste. Sharks are the obvious villains of the deep ocean, even though there are many other animals that can cause harm to humans in the water. Because sharks get all the attention for vicious attacks, they have become a creature that warrants anger towards them. In reality, sharks don’t purposefully go out to eat people; instead, they mistake them for other means of sustenance, like seals. A human on a surfboard and a seal look more alike to a shark than one would think. Sharks are often too curious, and attack humans, even if they don’t truly know what they are biting. They aren’t the brightest creatures, but they do have exceptional senses that prove to be deadly for other animals, sometimes. While shark attacks are rare, and death is an extremely rare side effect of this animal, it is important for people to understand how to avoid a being attacked, and escape with their lives. Prior to addressing actions to take once a shark is already in your vicinity, it is vital to understand how to prevent a shark from ever coming near you. Yeah, even if you do all these things, sharks may still show up, but taking these preventative measures really could save a life. There is no way to avoid going near the water, it is a part of life. 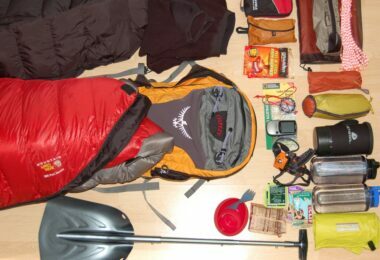 So, we must be prepared for when we are in the open water either by choice, or by natures’ choice. First off, if you know sharks are in the water or they have tendencies to swim around the area, it probably isn’t a good idea to jump in and find out. Traveling to a place where the water is shark free won’t guarantee safety, but it will reduce the chance of an attack greatly. If a shark can be seen anywhere in the water, get out as soon as possible. Sharks are great swimmers; don’t be left out in the open by yourself. Which leads into the next preventative measure for shark attacks. Stay in a group. There is a much greater chance of getting attacked if you are by yourself. Instead, swim in larger groups, to deter sharks. As a general note, stay close to shore. The farther out to deep ocean you get, the better chance there is that sharks will show up, with the exception of the Bull Shark. 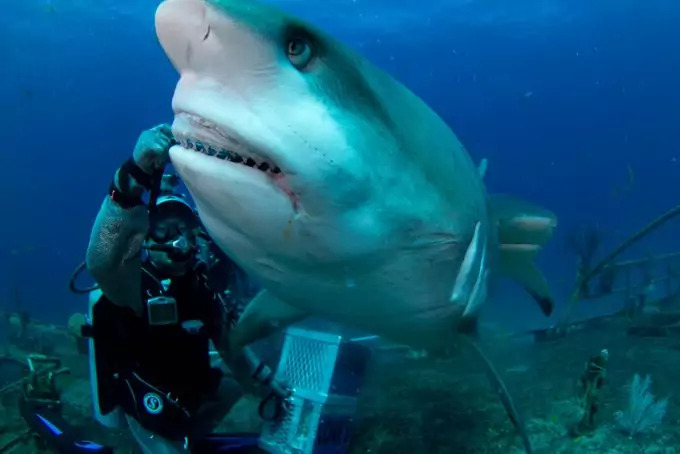 Bull Sharks thrive in shallow waters. Stay away from the water from the beginning of dusk, all the way until nighttime. Sharks are very active when it isn’t as hot, and it would behoove you to avoid the water during those times. Perhaps one of, if not the most important piece of advice in preventing shark attacks is to stay out of the water if you have a cut or you are bleeding. 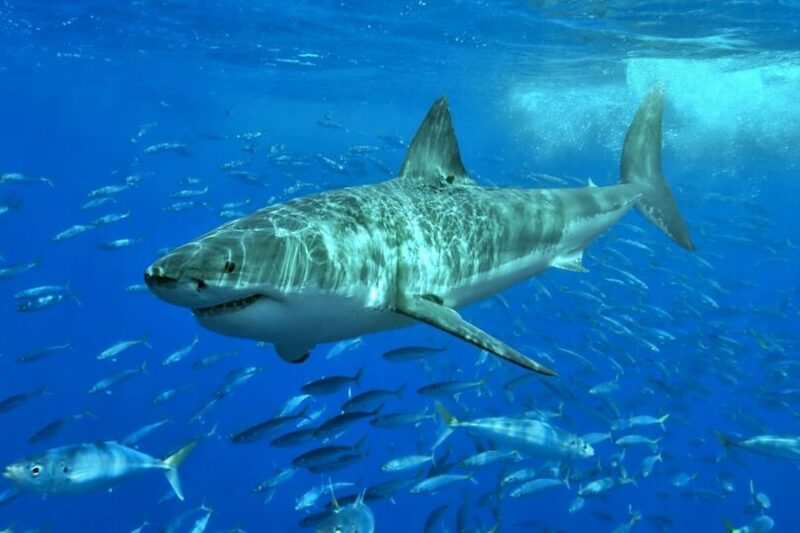 Due to sharks’ keen sense of smell, they can pinpoint blood from a great distance away. Even the smallest drop of blood can make a shark attack a swimmer, especially if the wound is still bleeding. You are asking for trouble if you get into the ocean with a cut. Next, do not pee in the water. This may comes as a surprise, but it makes sense considering how blood affects sharks. Urine, similarly to blood, has a distinct scent and sharks can easily pick up on this smell, causing nearby sharks to flock to your location. Do not hang around huge drop offs in the water and stay clear of any water between sandbars, as sharks are often found lurking in these convenient places. A shark could sneak up on anyone if given a hiding spot, even if it is easily visible. Try not to wear shiny necklaces, bracelets, rings, etc. Sharks have great sight, and a shiny or bright object will stand out to them when contrasted to the dark waters of the ocean. This object will then attract the sharks in the area, and could cause them to be curious enough to bite swimmers. Stay away from any sections of water that are regularly fished for sport or commercial reasons. Sharks are more likely to be found hovering in these waters because there is more food for them to eat, in the form of bait and unwanted substances from fishermen. While this bait attracts small fish, a group of fish will form around the scraps, creating a giant ball of shark food. Sharks will be very aggressive in these areas of water and you don’t want to get caught swimming with hungry sharks. 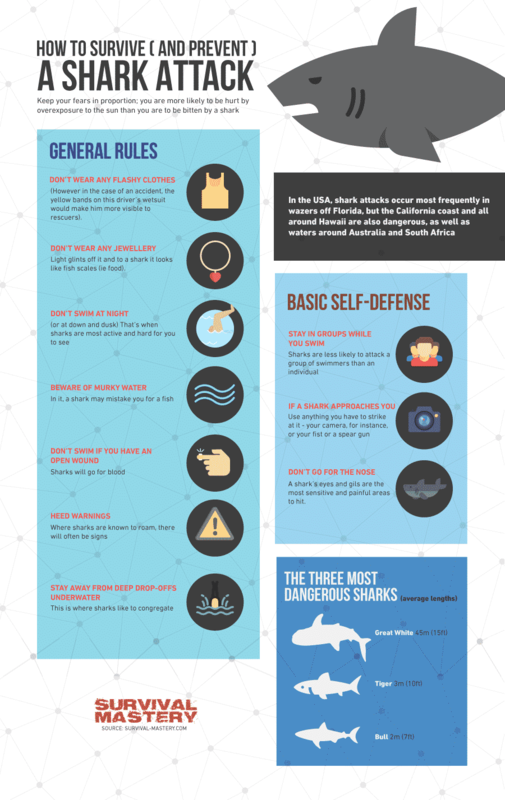 All of the previously mentioned tips to prevent shark attacks are beneficial to know, but they don’t guarantee that a shark won’t swim up and take a bite. If a shark is near you, there are certain guidelines to use when trying to escape a possible attack. These rules are to be followed when a shark is within striking distance and you can’t immediately jump back into a boat. 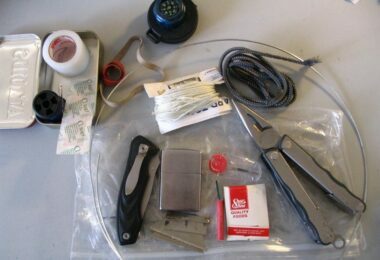 For more basic survival skills, read our informative article to learn more. Whatever you do, don’t take your eyes off the shark. Sharks are unpredictable and don’t follow a specific way of attack. Some will circle and circle until they deem it a good time to dive in and attack. Others get it over with quickly and swim right up, and even some others try to attack from behind. You have to know where the shark is at all times in order to plan the right escape. Just as they say in any potentially life threatening situation, stay calm. Don’t make any sudden movements, only calculated ones that won’t attract the shark. There is not one person on this entire planet that can out swim a shark. It just won’t happen, so don’t try it. Obviously, if you are 10 feet from the shore, you can get there in time, but otherwise, stay calm. Maybe the most important aspect to surviving a shark attack is to constantly be thinking. Use your mind to your advantage and don’t let it get carried away in panic. Begin to swim slowly towards a way of escape. If you are near a boat or shore, smoothly make your way the safest way possible. Do not splash or kick while swimming, the shark might take that as a sign of aggression. Again, keep your eyes on the shark and do not turn your back to it. If you happen to be cornering the shark, move out of its way so that it can travel back to open ocean. Odds are, if you are blocking the shark’s means of escape, it will attack. As long as your movements are thoughtful and smooth, the shark should go away. If, for some reason, you are unable to get out the water, find a place that will reduce the angles at which the shark could attack. Back up against a sandbar, rock formation, reef, or whatever else you can find, so that the shark cannot circle around you. If the shark can’t go behind you, then it can only attack from directly in front of you. This is an obvious advantage over the shark. Divers who find themselves in trouble could also use depth as cover form the shark, in the form of sunken ship or underwater formation. If there is more than one swimmer around, get back to back with each other, so that you both can see the shark head on. 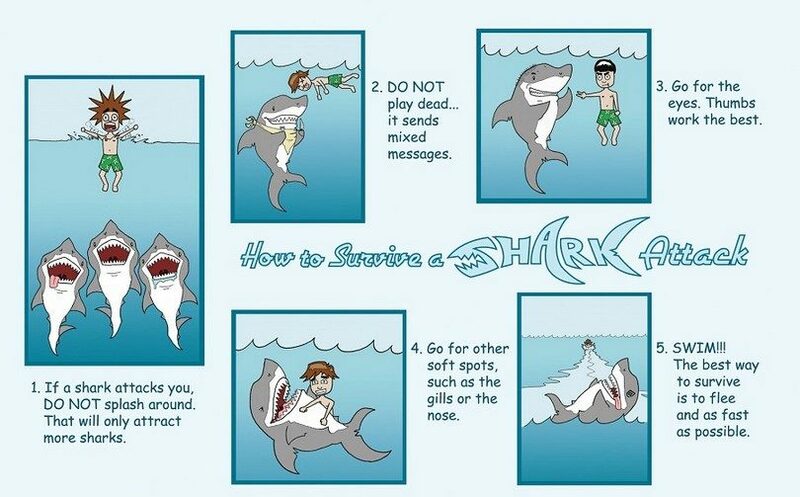 Although these methods should help in the event of a real shark attack, if worst comes to worst, you must fight. Since the sharks aren’t going away, and they seem ready to attack, you must be ready to fight. Fight back any way you can with anything you can find. A shark attack victim has the best chance of survival if he/she shows the shark that he/she is a threat to the sharks’ safety. The best place to hit a shark is in the gills, face, or snout. These areas are the most hurtful for sharks and can cause the shark to swim away in fear of pain. If a sharp object is floating near, use it to gouge out the eyes of the shark. Aim for anything near the head. Even something so simple as a rock could save your life. Otherwise, use your hands, feet, and elbows to smack the shark in a potentially hurtful area. If the shark continues to attack without relief, don’t give up. Hit until you make contact with the shark. Use quick, short jabs to inflict pain, as rearing back in the water will do no good. Do not be afraid to use anything through any means to hit the shark; your life is in the balance. In the event that you have enough time to make it to safety, go for it. Getting out of the water is the best way to avoid being hurt, obviously. Even if the sharks go away, there is always a chance that they could come back, and that’s a chance no one wants to take. If you have no way to get out of the water, but a boat is off in the distance, call out. Make sure to call out as calmly as possible, so as not to get the attention of any sharks in the vicinity. Stay as still as possible, and only swim without making noise or splashing. This will increase the chances of surviving a shark attack. Slowly make your way towards the safety of a boat or shore. Once you make it to safety, get medical attention as soon as possible. No matter how bad the bite looks, get it looked at. And even if you don’t have a bite, get checked out. Better safe than sorry. 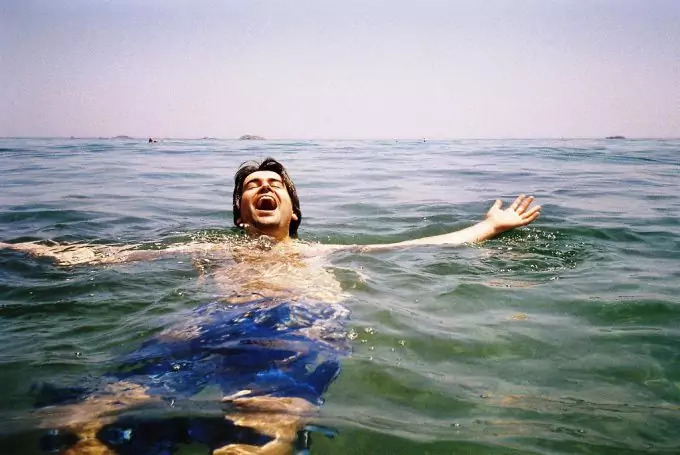 Shark attacks cannot fully be prevented; we can only hope to put ourselves in a situation that decreases the chances of getting bitten. With careful planning, and the execution of the survival principles we have mentioned before, there is a much better chance of surviving a shark attack. Following those specific rules will allow you to think clearly and quickly when time is of the essence. While Sharks and dangerous animals usually don’t have any ill will towards men, they can still do a lot of damage without meaning to. Most of the time, animal attacks are due to mistaken identity or because the human is threatening an animal’s habitat or offspring. Regardless, it is important for us, as humans, to understand that we must protect ourselves from incidents involving animals because those animals don’t know what they are doing. Prevention is the best way to keep from being put in a situation where an animal could take advantage of you and cause problems. As previously mentioned, if you plan ahead, you can save yourself and your loved ones form being put in a situation that could potentially become life threatening, due to an animal within your vicinity. 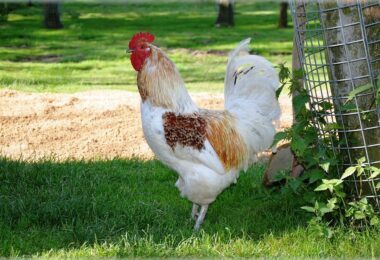 Pick specific times during the year that animals are less likely to be around. This is usually in the late fall time of year, and decreases the chances that animals will be active. Also, don’t go out at night if you plan to be walking for a while. Most animals go searching for food when the heat of the day starts to go away. This allows them to become more efficient with their energy, but it also makes them slightly more aggressive than usual. As long as you plan, execute, and can think clearly, you can survive a shark attack or any other attack, if necessary. In case of wounds, read our article on how to determine if a cut is infected – better yet, head on to the nearest hospital to have it treated.